An Egg Cannon in Kingdom Valley. 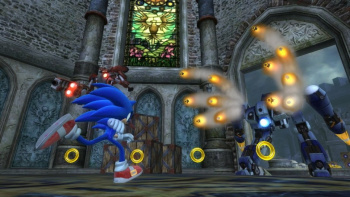 Egg Cannons are combat automatons constructed by Dr. Ivo "Eggman" Robotnik, deployed by the mad scientist in and around Soleanna during Sonic the Hedgehog (2006). It's a lumbering, bipedal mech and one of Dr. Eggman’s larger mech creations. The core is perched on two legs and each foot is adorned with a drill bit for melee attacks. The Egg Cannon is equipped with superior armor, a transforming mechanism that allows increased mobility when in its flying form, the vulkan cannon, two small homing missile riffles and a laser gun. The Egg Cannon's weak point are the legs, which hit will knock the robot off balance. It has some armour, taking three hits to the core to destroy. It has an advanced model, the Egg Walker.